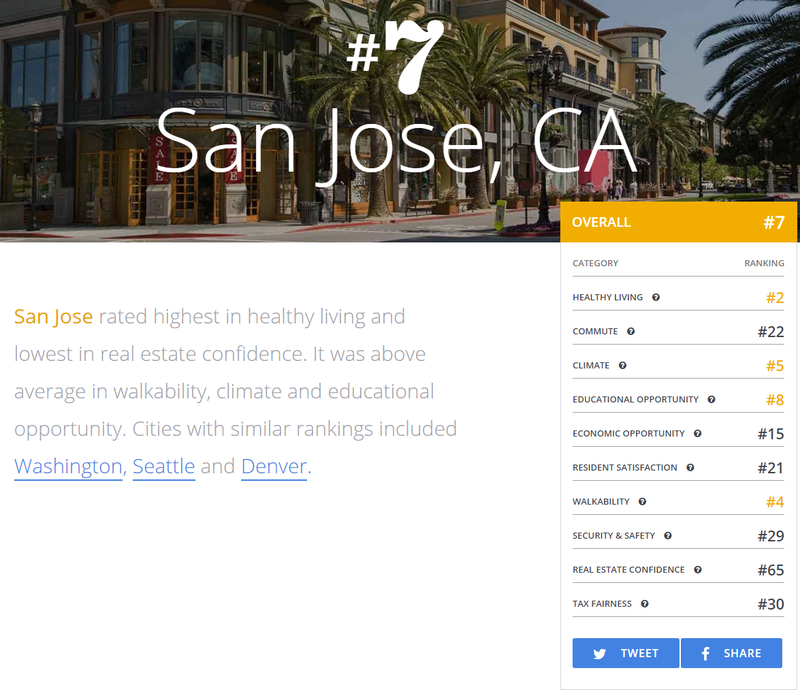 A new survey conducted by Porch and Redfin ranked San Jose as the 7th best city in the US to own a home. They looked at a variety of factors such as health, education, economy, walkability, safety, and traffic. Note that this study is based on people's opinions and not objective metrics. San Jose scored very highly in healthy living (#2), climate (#5), educational opportunity (#8), and walkability (#4). All of those sound about right to me except for walkability as there are only specific neighborhoods that have high walk scores. The lowest scores were commute (#22), and I expected lower on this one, real estate confidence (#65), and security & safety (#29). Again these are people's perceptions. I would disagree with the safety ranking as statistically San Jose is one of the safest large cities in the world. The biggest surprise was that economic opportunity only ranked #15. By any objective criteria this should easily be #1 for the country. Overall, San Francisco ranked #47 on the list while New York can in at #26. For the full list hit the link below.